Does your day start with a battle every morning to get your teen out of bed? Are they apt to sleep nine, ten, or even twelve hours on the weekend? Are they constantly complaining about how tired they are? The trope of the sleepy teen is usually played for laughs on TV and in movies, but it can be quite worrisome when it’s your child who seems to be constantly exhausted. When it comes to chronic sleep deprivation in teenagers, is there anything that can be done? Research suggests that sleep deprivation in teenagers is more prevalent than ever, which is putting their mental and physical health at risk. When your child was little, you had to beg and plead them to go to sleep, and now, you practically need a crowbar to get them out of bed. What happened? Primarily, biology happened. According to the National Sleep Foundation, “teens need about 8 to 10 hours of sleep each night to function best.” Additionally, as children reach a stage of rapid mental and physical development, their biological sleep and wake patterns naturally shift towards later times. It’s normal for a teen to not be able to fall asleep before 11:00 PM. When you combine this biological shift with early school schedules, extended technology use, expanding social calendars, and other stressors, it means that teens are rarely getting as much sleep as they need. In fact, teen sleep has definitively declined over the past 20 years according to a study published in Pediatrics, the official journal of the American Academy of Pediatrics. In the study, most teens were only getting about 7 hours of sleep each night, which can easily lead to sleep deprivation. The cause of all that moodiness associated with teenagers could actually be due, at least in part, to sleep deprivation. Sleep deprivation in teenagers creates a risk for major depression in adolescents. Additionally, research suggests that a lack of sleep may interfere with how the brain processes rewards, possibly affecting mood and making teens more likely to engage in risky behaviors or develop addiction issues. New research even reveals that it can increase a teenager’s risk for heart disease. A 2018 study conducted by the American Academy of Pediatrics observed the sleeping habits of 829 adolescents between the ages of twelve and sixteen. It found that inadequate sleep was highly prevalent with 31% of the teen participants sleeping less than seven hours each night. The participants with shorter sleep durations and lower sleep efficiency had the least healthy cardiovascular and metabolic profiles, meaning they had increased body fat, higher blood pressure, and lower HDL-cholesterol. HDL-cholesterol is considered a “good” cholesterol that removes “bad” cholesterol from the body. When HDL-cholesterol is low, the risk for heart disease is increased. It is clear that teenagers need sufficient sleep to feel their best and avoid health risks when it comes to their emotional, physical and mental wellbeing. Build time into your teen’s schedule for between eight to ten hours of sleep. Have them turn off all of their electronic devices an hour before they’re supposed to go to bed. You can help with this by only letting them charge their devices outside of their bedroom or by putting their phones on the “Do Not Disturb” setting. Ensure that your teen’s room is completely dark and quiet during the night. If blocking all noise and light from your teen’s room is difficult, buy them a white noise machine or and/or eye mask. You can help your child and many others by supporting community efforts to have later high school start times as well. Teens are naturally inclined to sleep late, and making them get up early for school is only making the likelihood of complications due to sleep deprivation worse. If your teen exhibits behavioral issues, and you observe that they are snoring or consistently getting poor quality sleep, it may be worthwhile for them to get a sleep test to determine if they have a sleep disorder, like sleep apnea. If they do have sleep apnea, they’ll need treatment. Treatment options include surgery, a CPAP, or an oral appliance. Many teenagers prefer oral appliances because they are portable and less bulky than a CPAP machine. 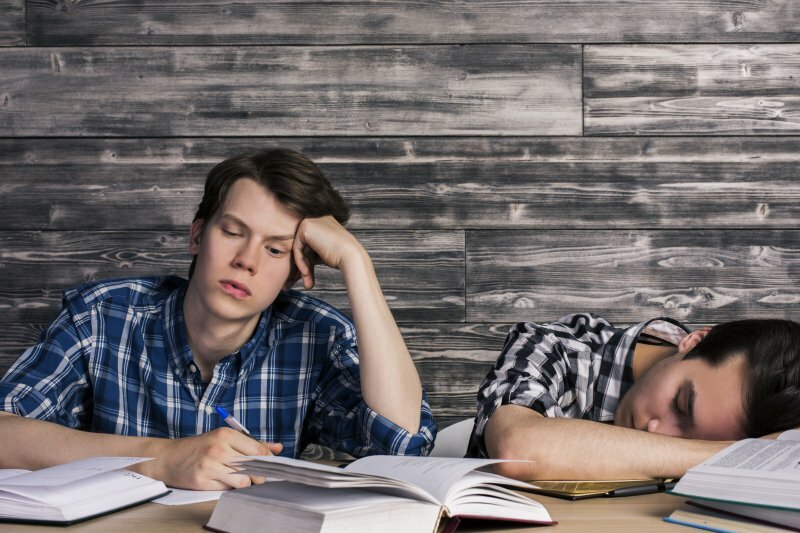 If you’re concerned your teen may have a sleep disorder, schedule a free consultation with Sleep Better Georgia today to place your teen on the path to better sleep and improved health.